So, this week is bittersweet for most kiddies, tweenies, and teenies because it's back-to-school time! And what better way (for the parents) to celebrate than a themed mani? Haha! I've seen two designs on Pinterest as of late: lined loose leaf paper and pencils with erasers and because they were both so cute, I couldn't decide on just one! Psyched to see what you've got going on this week! Super cute mani, I've seen a few of these lately. Wonder why that is? Haha Have a great weekend! I'm such a sucker for those shades of blue, love this! I work at a university, so it's school all year round for me. Having said that, we started fall semester last week and my schedule is ramping up again. I need coffee. I've seen a lot of back-to-school designs on Pinterest. So cute! Yay. I can still link up. 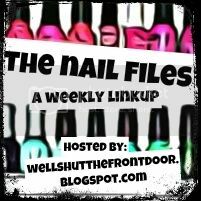 I had eye surgery last Wed, so I pre-posted my nail files for Friday. haha. That's a cute idea with your nails. This is so cute! And I LOVE BTS!!! Woohoo!!! haha My oldest started back on July 24th and my pre-Ker starter back on August 1st. I wanted to do a BTS mani and never got around to it. Oh well. Love this and it looks great! Cute nails. I wish I would've done a back to school mani. I love your videos :) This mani is just too cute!